Nope, I’m not. I don’t carry around cool Vera Bradley totes or embroidered Thirty-One diaper bags. Mostly because you can buy that stuff so cheaply at the markets in Thailand, so on principle I refuse to buy it. And also because it’s expensive. I don’t have a set of Uggs, mostly because I think they’re uggg-ly. And also because they’re expensive. I rarely wear jewelry other than rings, and the holes in my ears grew back a long time ago. I don’t usually decorate my classroom for the different holidays and seasons. If I spend money on school, it is for instructional materials or supplies, not decorations. My kids don’t wear boutique clothing brands or big fancy multi-layered bows that only match one outfit, except maybe on Easter. (Well, I guess Ephraim would look silly in a bow.) They wear clothes from Target, Walmart, JCPenneys, and Kohls. My daughter hates jeans, so she usually wears soft yoga pants or sweatpants. She wears a uniform to school, but they are allowed to wear jeans on Fridays, and she usually doesn’t even do that! She prefers to wear a uniform skirt to itchy jeans. I make her wear a bow on Sundays, but she prefers to wear her hair down and rather messy-looking most of the time. Which is fine with me. She was so proud, and so was I. The project was self-directed, helped her practice skills, and well done. Not frou-frou at all. (Okay, so I might not have put so much glitter glue on it, but it’s all good.) 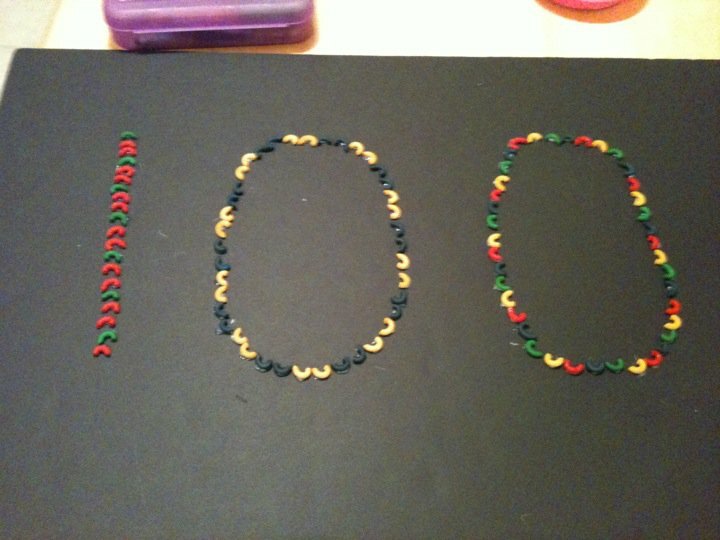 And I snuck a peek at the 100 day projects when I picked the kids up today. 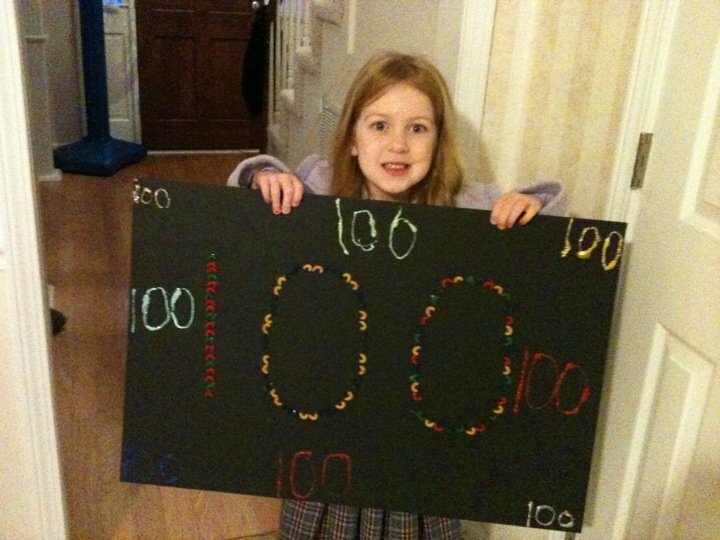 Most of them were simple and obviously done by a child: 100 gummy bears, 100 goldfish, 100 paperclips, etc. You know I let out a little “Thank goodness” in my mind, right? And then I looked at my daughter’s 100 macaroni noodles and grinned. Atta girl. Way to go Madeleine! That looks great! Around here the big thing is Coach bags. I actually started a fight on my facebook for having a negative status update about them . . . crazy!!! Coach bags are popular up here, too. I just forgot about them! A teacher at my school was talking about how she found a great deal on some coach purses – and they were still $175!!!! Unbelievable! I must have missed the fb war over your status!